Merry Christmas from The Thompsons! Greetings from cold and snowy Wisconsin! Whew! Can you believe another year is almost over? Time certainly does fly -- especially when you've been as busy as we have! 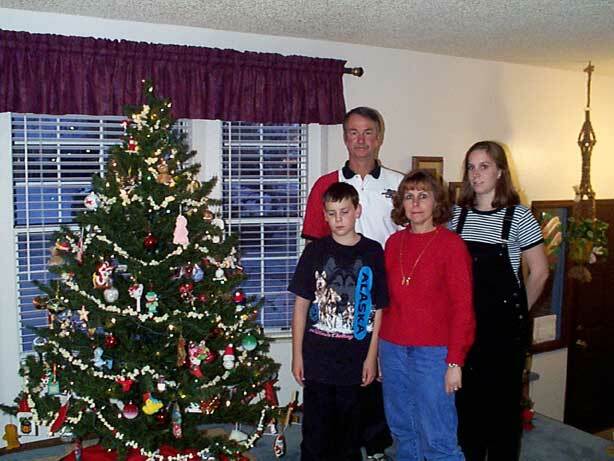 2005 was an exciting year for The Thompson Clan. You may already know that Kevin's mother passed. Mary finally lost her fight with morbid obesity. She'd been bedridden for the past several years and we all think she's in a better place now. We all appreciate all the warm cards and condolences. On a happier note, the money from the sale of her estate allowed Kevin and I to take one of the first vacations without the kids! We drove to Madison for a long weekend and enjoyed a taste of city life. We took in a U of W football game and took a tour of a local brewery. Everyone got a paper cup from the latest batch at the end of the tour. I usually don't drink, but did have a few sips of the lite version -- have to watch the calories! We also ate in a real French restaurant -- Kevin thought it was funny to tell the waiter that I wanted to have Es Cargo. They certainly don't have that at Bennigans! After all the rich food, I made a few extra trips to Curves when we got back. I have to keep my "girlish" figure! Ha! Kevin continues to work about 60 hours a week at the lumber mill. I pray every night that he comes home with all his fingers -- that's my little joke! I'm still working at the credit union, but cut back my hours a little after Justin came to live with us. As you might have heard, my younger sister Pam felt that the stress of raising him by herself might be one of the reasons she's battled so hard with her alcohol problem. My father, rest his soul, also fought his demons and they say that it could be genetic. It also doesn't help that that deadbeat ex of hers hasn't paid any child support since Justin was in diapers! Since our oldest, Kevin Jr. left home to help fight for our freedom overseas, we've had an extra bedroom that wasn't doing anyone any good being empty. As good christians, we agreed to take on the responsibility of Justin. As "our" new youngest, we've found that he can be quite a handful -- but still rewarding! We're all learning a lot about patience these days. And fire codes. God's lessons don't always come as convenient, but, as good christians, we take them as they come. Becky is a senior this year. A normal teenager for the most part, she sits second chair saxophone in the school jazz band and really likes shopping and talking on the phone with her best friend, Marissa. She'd been planning on going to community college next fall, but things might be on hold as we found out that she and her ex-boyfriend, Chris, had quite a surprise for us. You guessed it: Kevin and I are going to be grandparents! I never thought I'd be writing that at the tender age of 45, but God's plan is not always clear. Until the baby is born in May, Becky will continue to work at her part time job at Payless and save money. The due date is right around commencement -- hopefully the graduation robe will help hide her tummy. We don't know if the little bundle will be a boy or a girl, but Becky says that she likes "Kayla" or "Dakota" or "Cooper" for names. I'm just praying that the baby is born healthy and has all his (or her) fingers and toes. Again -- joking! On the flip side, we're very proud of Kevin Jr. and his dedication to our country and commitment for fighting for what's right. He is a Private First Class in the 256th Separate Infantry Brigade based out of Lafayette, LA. He sends us letters from Iraq when he can, telling us that the food isn't as good as mine -- that kidder! -- and that the hardest part of being away is that he misses Dusty and his girlfriend, Amanda. Though, we haven't received a letter from him in several months, I keep telling myself that he's just too busy to write his mom. I also know that if it weren't for brave boys like Kevin Jr., those Islams would never stop until all of us good people are dead. This world is a scary place -- especially with those crazy suicide bombers. I can't help but think if they knew Jesus like we do, they would think twice about blowing up a bus full of school children. On another sad note, we had to say goodbye to our faithful companion, Dusty. He was a good dog for many years, and when he didn't come home for a few days, we thought that maybe Dusty had gone off on one of his adventures like he used to as a young pup. Instead, when Kevin Sr. went out to get the snow blower after that first big storm we had around Thanksgiving, he found poor Dusty next to a half-eaten box of rat poison. We haven't had the heart to tell Kevin Jr.
We hope this letter finds your family healthy and happy. May Jesus bless you with a Merry Christmas and Happy New Year 2006! The Thompsons -- Barb, Kevin, Kevin Jr, and Becky. And our "honorary Thompson": Justin Harter.